Hey, guys, how are you doing? It’s been a while. Sorry for not updating our blog recently. But here we come back with some good news!! So listen carefully and don’t miss the key points. or you can find it on the Services menu. There are so many choices, such as birthday cakes, sweet Chocolates, lovely flowers and luxury cars. All the stuffs are that women will like! The interesting side of these gifts is that it’s NOT just a picture but a flash animation. 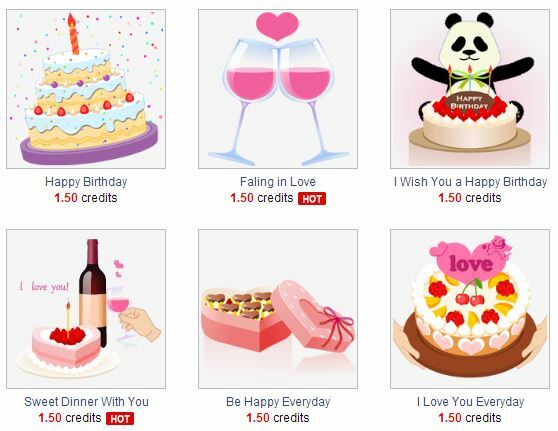 Take the ” Falling in Love ” Virtual Gift for an example. When your lady receive such a gift, she’ll imagine the romantic and joyful scene of drinking red wine with you by playing the flash. Lively, right? And if you’re not sure what your Asian lady would like, pick the gifts that with the word HOT, meaning the popular gifts for ladies. So why not log in and pick a virtual gift to your Asian girlfriend now? I bet she will be happy to receive your surprising gift!! Some of you guys must have had a good time with the beautiful Asian singles on our site through Free Trail Offer. But some of you guys must have no idea of this FREE service, right? What are the benefits of it? Well, in short, it allows you a) send introduction letters to your favorite ladies for free and b) get an opportunity to chat with new ladies for free. Oh, by the way, it’s not limited. You can send as many introduction letters to your favorite ladies as possible and flirt with them ( can’t talk to the same Asian lady since it’s a trail offer) . It depends on you! But we do have some simple requirement for those who want to get the offer. You should complete your profile and confirm your information, which let us know that you’re here for a serious relationship, not for fun. We really want to create a user-friendly dating platform with high quality for our members. So join in and get your Free Trail Offer, then share your thoughts about the trail. Grab the chance! It’s FREE!! This surely an inspiring news, right? 🙂 What more can I say? Just get in and see them by yourself. Thousands of hot Asian single girls and women are joining in the iDateAsia to meet love just like you. More hesitation, less good Asian girls, you choose!